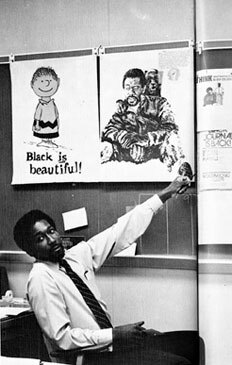 Presented through the pages of The Mustang Daily, Strive and Struggle explores campus reactions, struggles and triumphs during the Civil Rights years, and the efforts to establish ethnic studies courses, recruit black faculty and combat racial prejudice on campus. Images featured in the exhibition are from many collections housed in University Archives and available to the Cal Poly community. Change the Status Quo is a two day conference focusing on a student’s role in shaping society. 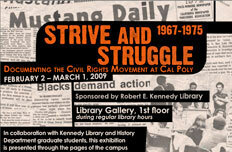 Come learn about the history of activism at Cal Poly as students coordinators of the Kennedy Library’s Strive and Struggle Exhibit present their findings! TGI Friday! It's 3:47pm right now.